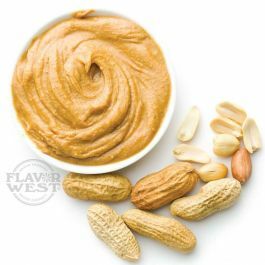 Enjoy a smooth and perfectly creamy peanut butter flavor. This flavor gives you a delicious peanut butter taste in cakes, desserts and pastries, cookies, pies, and more Type: Peanut butter Water Soluble Flavoring. Ingredients: Natural and Artificial Flavoring, Propylene Glycol and Ethanol. USP Kosher Grade Flavoring. Usage Rate: 15-20% for E-use. Flavor Suitability: Suitable for drinks, beverages, cakes, desserts and pastries, cookies, ice-cream, pies, and more. Specific Gravity: .99 No Refunds on Flavoring.